How to apply for VRO post? Re: How many VRO posts are there of Mahaboobnagar ?What is the Last date to apply? Total Number of Village Revenue Officers Posts in Mahabubnagar District is 23Posts. Last Date to submit the applications is 29Th/December/2011. You should pay the examination fee as on or before the 27/12/2011. You should submit your application as on or before the 29/12/2011. You can fill online on this below link. You must be Intermediate to apply the V.R.O. Posts. there are 23 posts have been alloted for mahaboobnagar district. Total number of VRO posts in andhra pradesh are 1172 posts. last date for application submission is 17-12-2011.
you should completed with your 10+2 standard from recognized institution. totally there are 23 posts..
the interested candidates should have completed intermediate from andhra pradesh board. The age of the candidates should be between 18-39 years. their will be relaxation of 5 years for SC/ST candidates. last date for submitting online application form- 29th december 2011. Hall ticket download date- 10th january 2012 to 25th january 2012.
how meny posts in dhanvada mondal? 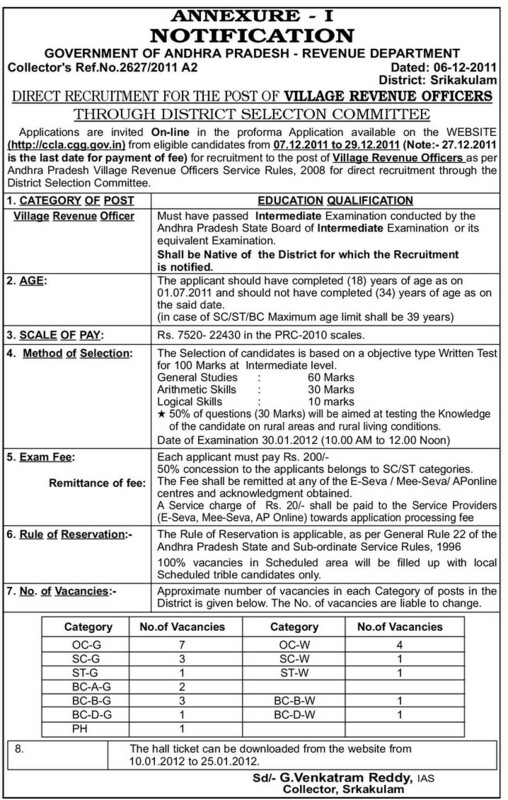 >> There are total 23 vacancies for Village Revenue Officer in MahboobNagar District. >> Last date for applying : 18.01.2012. >> Download admit cards: 28.1.2012 to 10.2.2012. There was a vacancy for the post of Graduate Apprenticeship Training (GAT) in Neyveli Lignite Corporation Limited. How can I apply for this post?